IGS has initiated a pilot project in 1995 for ITRF densification. Within this project, the IGS analysis centers produce weekly sets of station positions with full variance-covariance matrices provided in SINEX format. These weekly individual solutions are then combined by 3 associated analysis centers, namely JPL, MIT and NCL. 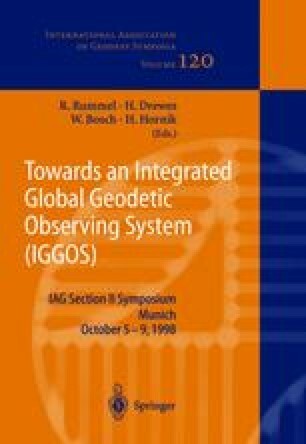 This poster will attempt to analyse some recent IGS weekly combined solutions with respect to ITRF96 used as reference by IGS starting on March 1, 1998. The analysis of these solutions will focus on their quality as well as the fit to ITRF96 in terms of terrestrial reference frame fixing. Moreover, as part of EUREF activities, analogous weekly solutions are also performed by CODE, which are also analysed and presented in this poster.